"Not only is this a unique resource, it is the only book that all practitioners and researchers must read to ensure that they are in touch with the extraordinary advances that the field has made over the last years. Many of us have all five previous editions; the current volume is an essential addition to this growing, wonderful series." "As either researcher or clinician living in the contemporary world of accountability, this invaluable edition of the Handbook is a must for one's professional library." 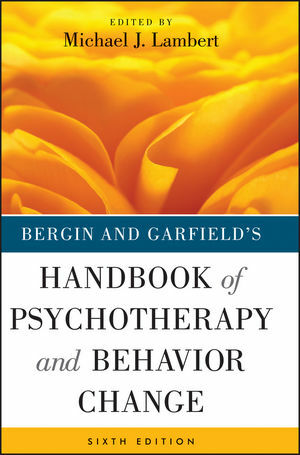 Keeping pace with the rapid changes that are taking place in the field, Bergin and Garfield's Handbook of Psychotherapy and Behavior Change, Sixth Edition endures as the most important overview of research findings in psychotherapy for professionals, academics, researchers, and students. This bestselling resource presents authoritative thinking on the pressing questions, issues, and controversies in psychotherapy research and practice today. MICHAEL J. LAMBERT, PhD, holds an Endowed Chair in Psychology at Brigham Young University where he teaches several clinical psychology courses while maintaining a private practice. His research, conducted over more than thirty years, emphasizes psychotherapy outcome, process, and the measurement of change. He is the coauthor of the Outcome Questionnaire, a measure of treatment effects.